The industrial revolution gave cites a bad name. They were overcrowded with people living next to dark satanic mills who would suffer from pollution and epidemics. But things have changed: sanitation and environmental standards improved in the last century. 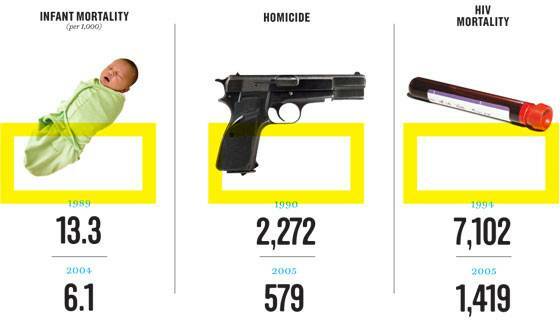 Isn’t New York a dangerous place to live? Well, not so much. Better policing and other public health and safety measures introduced in the 1990’s have much reduced deaths from crime. Another big drop was in HIV mortality rates. With the arrival of better drugs and health care death rates have come down. In 1989, the infant-mortality rate was 13.3 babies per 1,000, but by 2004, it had been halved, to 6.1, both because medical treatment improved and because alcohol and drug addictions eased. Cancer and cardiac arrest are down too. The number of people in the city dying from heart disease has dropped by a third in the last twenty years, and cancer rates have slid by nearly a fifth. And again in these cases, New York is getting healthier faster than the rest of the U.S. Why? A smoking ban in public places was introduced in 2003 and it had an immediate effect: The number of deaths attributable to smoking has decreased from 8,960 in 2001 to 8,096 in 2005, a drop of 10 percent. The easiest way to tell a New Yorker from an out-of-towner is by walking speed: The natives blast down the sidewalk at blitzkrieg pace, and the visitors mosey along like pack mules. 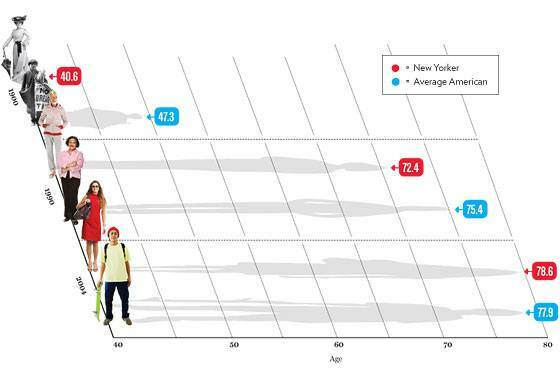 A recent ranking of cities found that New York has the fastest pedestrians in the country. Research has shown that walking speed has a strong health benefit. When you’re jammed up against your neighbors, it’s not hard to find a community of people who support you—friends or ethnic peers—and this strongly correlates with better health and a longer life. A big city has bigger hospitals that can afford better equipment—the future of medicine arrives here first. New Yorkers also tend to enjoy healthier food options, since demanding foodies (vegetarians and the like) are aggregated in one place. There’s also a richer cultural scene than in a small town, which helps keep people out and about and thus mentally stimulated. It is a well known fact that rich people tend to live longer than the poor. New Yorkers have enjoyed a long period of economic growth since the 1990’s. But as the rich became richer – and this is the little sting in the tail - the rising cost of living in the city has driven out the poor. Gentrification!